We had sliced up a bunch of onions for a family gathering, but when the meal was done we had a bunch of the onions left over. So we stuck them in the refrigerator to make on another day. Well it got to the point where I kind of forgot about them sitting there waiting to be used. Then when I was looking through the refrigerator and saw them sitting there… and I was like oh no what am I going to do with them. I am not sure why I decided on making the onions with the chicken, I guess it kind of popped into my head. I love making chicken on Sundays and I like making a simple easy recipe on Sunday too. 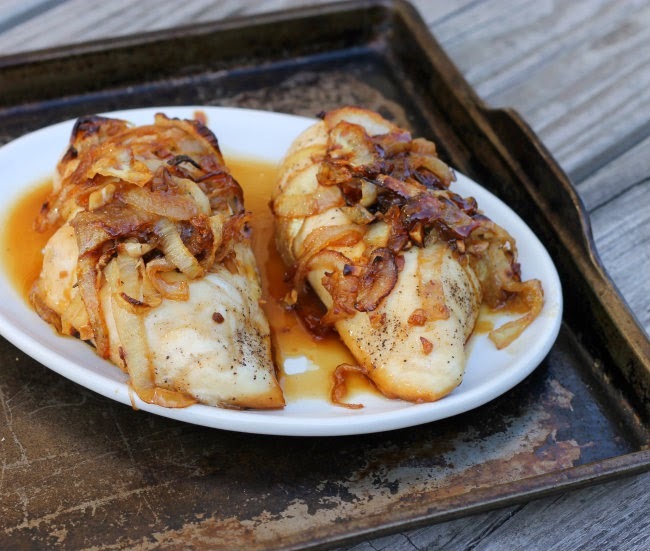 Caramelized onions are always delicious and serving them with the chicken made this dish so yummy. This a quick dish that you can make for a Sunday dinner or even for dinner during the week. 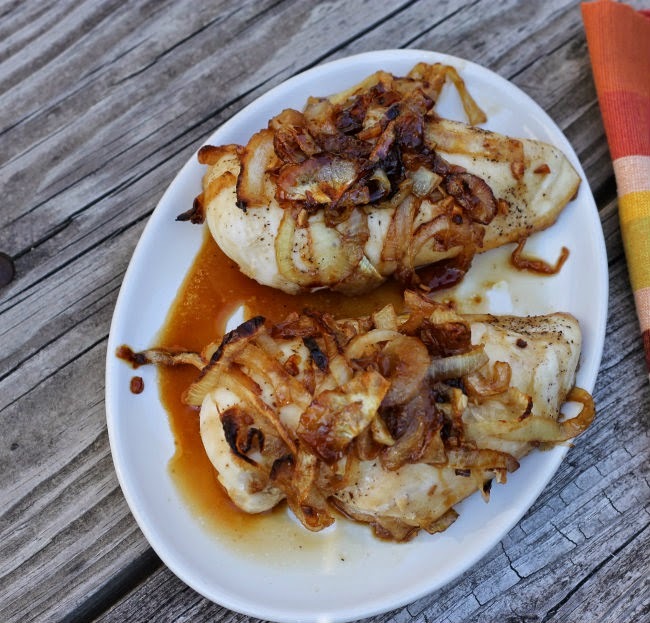 The chicken is nice and tender and onions keep the chicken from drying out. 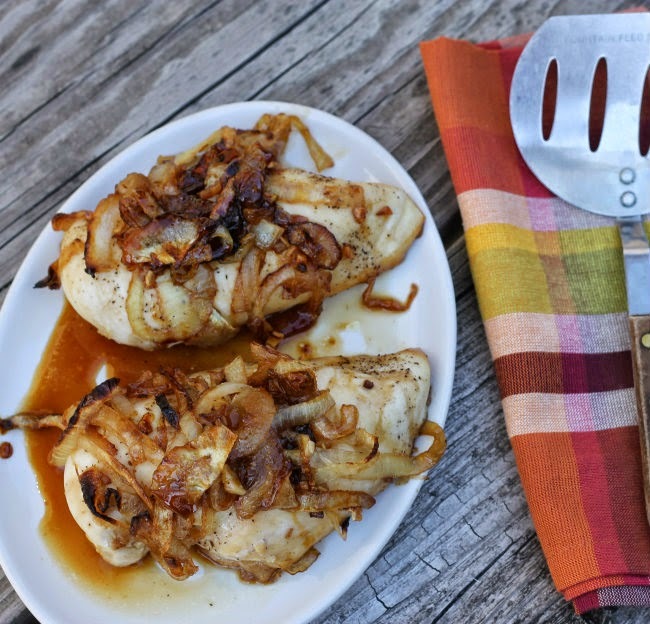 If you like chicken and caramelized onions this recipe is for you. 1. Heat 1 1/2 tablespoons of olive oil in a large skillet over medium to medium-low heat. Add the onions and garlic, cook stirring occasionally for about 10 minutes or until soft. Stir in the sugar, lemon juice, and Worcestershire sauce and cook for another 6 to 7 minutes. Remove from heat and set aside for a bit. 2. While cooking the onions preheat the oven to 425 degrees F. Oil a baking dish with the remaining tablespoon of olive oil. Place the chicken in the dish and season with salt and pepper. Take the onions mixture and spread evenly over the chicken. 3. Bake 20 to 25 minutes or until they are no longer pink and juices run clear. Cover loosely with foil if the onions are getting too dark towards the end of the cooking time. Let rest for 5 minutes before serving. I love caramelized onions and that dish looks amazing. You had me at caramelized onions. I absolutely love them in anything! Great looking recipe. I just love caramelized onions..with anything! This is a great dinner for any day! Awesome onion save! You can never go wrong with caramelized onions! I love caramelized onion. And garlic. And chicken. See where I’m going with this? 😉 Lovely stuff — thanks.